A central principle of this project is that the fragments should not only be described in their own right but also used to reconstruct as far as possible the manuscript from which it came. But how can we reimagine what is so substantially lost? The process of reconstruction is most often obviously possible when several whole leaves from one volume survive. There are a growing number of exciting projects (like Broken Books at St Louis University, Missouri) which are working with such material – but this pilot project is rather less lucky in its primary resources. It does contain some examples of full pages and the occasional opening, but most of what is available to catalogue is much less substantial (as shown in the image here). This, though, is what makes its significant: the ability to demonstrate that even from this more exiguous evidence some sense of the lost manuscript can usually be garnered. Not always – there are a few where we have to accept defeat. The guideline followed here is that only when further insight can be provided does the principle of double cataloguing pertain: in other words, there are a few individual fragments, each a lone survival from a manuscript, for which there is no Babel entry as they are so reticent about their origin that nothing can be added. Those cases, though, are very rare. Implicit in that previous paragraph is the distinction between cataloguing a fragment and what we call a Babel manuscript, and it is worth making it explicit. When recording a fragment, our intention is to describe what is in front of us, without making any further inference. It is when we attempt to reconstruct the Babel manuscript that we take all the shards of evidence and extrapolate from them to attempt to visualise what once existed. It is the difference, if you want, between describing what is before our eyes and what we see when we close our eyes. The key terms already used are inference and extrapolation; behind them lies another concept, that of comparison: we move towards reconstructing a manuscript by comparing it with those relevant ones that survive intact. This can be done in terms of both its textual content and its physical format. When the text of a fragment is identified as a gobbet from a much larger work, it is usually a safe assumption that the volume would have provided a copy of that work – though there can be reason to wonder whether, say, extracts from the Gospels signify there was a complete Bible or solely a New Testament. In cases where the text we have before us comes from a shorter work, the essential question is in what sort of volume would that text have sat. To give an example from the pilot: the printed book Harsnett H.f.27 includes a binding strip which provide sections of the Life of St Kenelm. 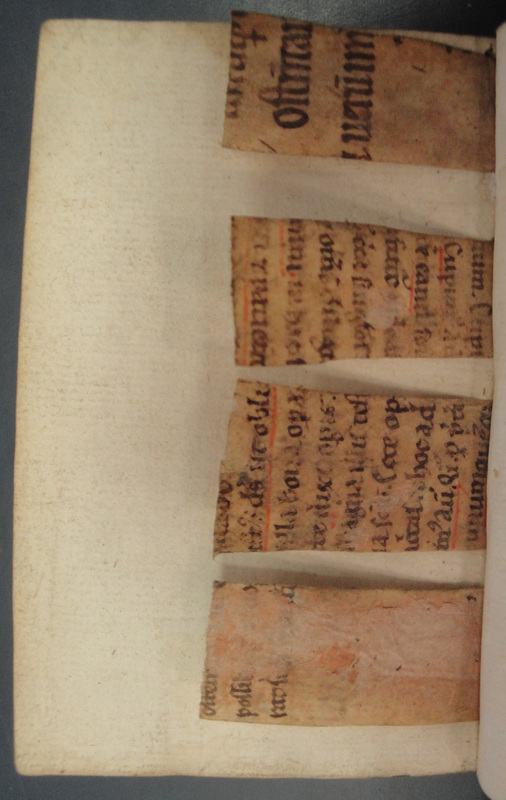 As that text is fairly brief, what else would have been in the manuscript? Would it have been a hagiographical collection? Probably not, since the sections we have show that the text jumped from chapter two to chapter five – a shift which occurs in none of the extant copies of the Life but is common in Sarum Breviaries. The comparison of the textual evidence with other manuscripts, then, is suggestive of the sort of volume from which this strip comes. Perhaps the most interesting possibilities for reconstruction come in terms of extrapolating the size and layout of the page from fragments much smaller than a folio. Here a general rule of thumb can be applied. It is well-known that sheets of paper were (and are) made to the ‘invariable ratio’ of √2:1, and that the usual process of folding those sheets replicated the proportions for pages. Parchment – which, by far, is the material more frequently re-used in bindings – does not, of course, strictly follow the same ratio and, what is more, the proportions of books changed over the centuries, with the page becoming more rectangular. What is more, the basic measurements we can usually discern are not page-size – even with the most substantial fragments, the re-use in bindings means that the page has been re-cropped – but dimensions of layout which can be slightly different in proportions. All those caveats notwithstanding, for most of the fragments that we have, an estimate of width of written space being between 0.6 and 0.7 of its height is reasonable. So, if the fragment or fragments combined provide just one co-ordinate – giving, for instance, the height of the written space (as in the case above) – then the other co-ordinate can be estimated. The result can be, if the text is known from other manuscripts or an edition, then corroborated by judging the space that would have been required for the section in the text which were originally been on the page but which are now missing. This process, then, begins to help visualise the page as it would have been. That, in turn, may assist future identification of further surviving but unidentified elements from that page. However, it must be said that these process of extrapolation are in their infancy and will, we hope, be refined and perfected as the project continues. Your thoughts, experiences and advice would be very welcome: we look forward to hearing from you.